yeah that's always a cool idea to order some more, I can sell them or at least pay a little bit less for them if it's possible:) Anyone else want to join in? The thing I need to know is the diameter of the hole on the espressoparts Mazzer chute replacement. Can anyone measure theirs? Last edited by Ordo.dk on Sun Jan 13, 2008 1:10 pm, edited 1 time in total. Mod's Edit: Photo(s) resized to fit page and prevent stretching. ok so I've talked to a couple of metal spinner again and they say I will have to have a steel base to spin the metal around. This basically means I need to make myself a 20kg element which is shaped like the part I want to produce, but instead of being hollow it's full. I'm not sure about the prices of steel in Poland, but I'm guessing the whole thing will cost around 20GBP to make (inc materials). Each spin piece will cost around 10GBP, so the best idea is to make at least 5 of them to split the cost of the base. Count me in. were the measrements good enough?? Where is the hole for the bolt on brummies drawing? That one is a bit difficult to measure. I have to detach the funnel. Besides I can only give you the measurements for the Mazzer Mini. (I assume the Super Jolly has the same, but I'm not sure. I have to ask Aadje to do the measurements on the Supper J. Will there be a lid for the thing? yeah I was actually thinking whether to add the holes or not because without them you can easily use the funnel on any machine. I might add the main hole for the burr chamber, but those two smaller ones for bolts are probably going to be left out (or I might do them, it's pretty much your call). 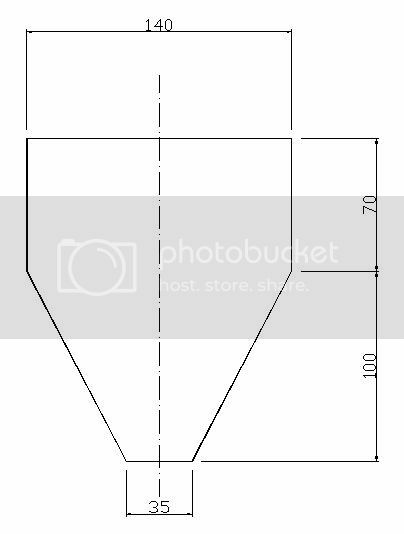 It's not final as I'm waiting for Cakey to measure the diameter of the doser and I will use the same diameter on the funnel (i'm guessing it's around 140mm). Today one of the metal spinner contacted me and said that I can opt to use brass for the funnel and have it chromed later. What do you say to something like that?